TTC News Archives-Trans Texas Corridor: "Never underestimate the stupidity of the Texas electorate." "Never underestimate the stupidity of the Texas electorate." The Fort Worth Star-Telegram article on the 11 propositions passed by voters yesterday contained a quote that would be funny ha-ha if it weren’t so funny weird/tragic. The story describes how Texans stood tall in favor of property rights by voting a whopping 81 percent in favor of Proposition 11, which restricts government entities that want to nab your private property at a pittance by using eminent domain, and then turning it over to private developers who make a fortune at your expense. Texans began clamoring for the added protections after the U.S. Supreme Court’s controversial decision in 2005 to allow using eminent domain for private development purposes. What the article failed to mention was that Perry vetoed a similar proposition in 2007 even though it was passed overwhelmingly in the state House and Senate. At the time, Perry was touting the Trans-Texas Corridor. In other words, he wanted to allow a foreign-owned company to rely on eminent domain powers to take private property from farmers, landowners, and homeowners, and then turn that land into a toll road that most Texans didn’t even want. So he vetoed a proposition that had been handily passed by your elected representatives. That was the first insult. Now, he’s using the old “don’t mess with property rights” blah-blah-blah while basking over the passage of a proposition that could have been established two years ago if not for him. 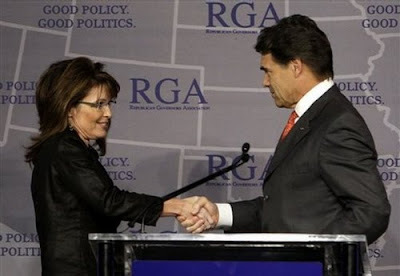 But Perry’s got good hair… and he’s so handsome that even a hottie like Sarah Palin (okay, a mentally disturbed hottie) looks awed by his visage. So voters will probably re-elect him again. "There is a viable non-tolled option."